2. Santuario Felino Rey Ashoka, A.C.
4. Patronato Por Ninos de San Miguel de Allende, A.C. I was amazed at the outpouring of love, passion and support for these charities. Thanks everyone! The $15,000 MXN in funds will be distributed to the top four finishers in the poll: $8,000 MXN to first, $4,000 MXN to second, $2,000 MXN to third and $1,000 MXN to fourth place. I will contact each of these organizations today to provide their awards. Later today I will put up another post to discuss the Good, the Bad and Ugly about this process and how we can do better next time. 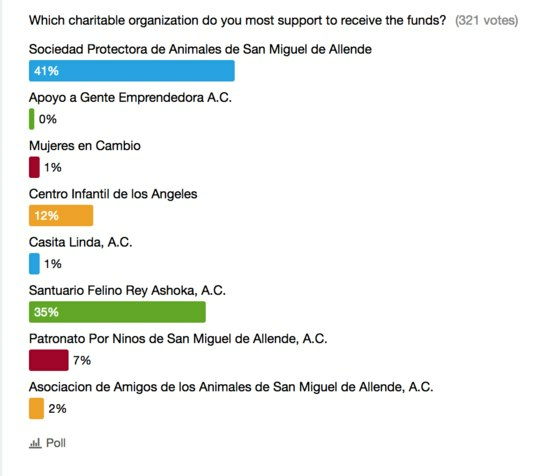 We are THRILLED that the Sociedad Protectora de Animales de San Miguel won this contest!! We appreciate that this contest was created to benefit SMA charities. Within a very short time after the contest ended (about an hour), our winnings were wired to the S.P.A.'s bank account. Fabulous! Thank you to all our supporters who voted for us. These funds will be used for our 100 cats and dogs. Congratulations to the 2nd, 3rd, and 4th place winners. We’re sure they will put their winnings to good use as well. Bless you, bless you. These charities sooo need help. Thank you for organizing this effort and attending to so many details. Namaste. We want to thank every person that supported us with their votes and their comments recognizing our job for the wellbeing of animals. We want to thank of course San Miguel FAQ for organizing this contest and for the prize. Funds were used to buy some cat food and pay part of a Vet bill. Blissings. Lola Cortina - Santuario Felino Rey Ashoka, A.C. I would like to nominate Santuario Felino Rey Ashoka, A.C. for the August contest. Is it too early for this nomination?